Let’s talk a moment about curing soap. If the soap was made properly, cure time is used for giving up excess water to the air. This is great if you live in a desert, but what if you live in a humid location? We highly recommend all soap get cut in 24 hours or less. Sometimes a batch doesn’t allow for cutting this early, so review where your soap went wrong if this is the case. Once the soap is cut into bars, stack the bars Stonehenge style. This will allow a lot of air to circulate around the bar. Turn over every few days if the surface you are curing on is solid. I really like ribbed shelf liner materials, but this can leave lines in the soap. If you don’t mind a few lines, try the ribbed shelf liner. If lines bother you, turn your soap more frequently. If your location is very humid, use a dehumidifier in the room where you cure your soap. The removal of water from the air will help the soap dry sooner. As soon as the soap is cut into bars it is safe to use. Yes, you read that right. Curing will help the bar last longer, but does not fix the problems of a poorly made soap. If you live in a humid environment, we suggest using shrink bands instead of bags. This will allow some moisture transfer while the soap is in storage awaiting sale. If you live in a dry environment, go ahead and bag your soap. The caution for bagging is when the soap will be in direct sunlight. Moisture beads will form inside the bag if you store any sealed soaps in direct sunlight. This isn’t a pretty sight and will certainly be a distraction to active purchasers. While curing we don’t suggest storing dis-similar scents together. The subtle scent of Cotton will absorb the Potent Peppermint without your permission. It happens. Now, which is which? Avoid this confusion and fragrance migration by storing similar soaps together. If the soaps are for your use only (friends and family too) and you aren’t labeling, then just store the dried bars in a cardboard box which is labeled on the outside. The cardboard will keep things from getting too moist and won’t allow significant fragrance transfer between boxes. Tomorrow I will cover botanicals and saving a batch. They both start with great teas! So, get out your tea pot and let’s save a misbehaving batch of soap. Stonehenge for curing soaps found in our test kitchen. Side view of stacked soaps. Thanks for the Stonehenge description and pic. I often dry my soaps on baking racks and then don’t have a rack to cool the cookies. is NOT a bad thing. Recording them is the best thing you can do. DO NOT get hung up on what the readings are. Just make small batches of soap until you can SEE the process. Once you have mastered the connection between XYZ temperature and ABC result, you will know what to look for. We want you to make test batch size because if you were to make large batches of soap instead of these 1 lb fat batches, you would have to remove your car from the garage so you can have sufficient space to store your soap! Trust us when we say that you will start to see the correlation between temps and the results, but right now there are other things to be OCD about, like wearing goggles. What do you use to cut such perfectly shaped bars of soap? Do you stack molded bars Stonehenge style as well? We use crinkle cutters or benchers. Benchers are sometimes called dough cutters, dough scrapers, or bench knives. A crinkle cutter looks similar but has wavy blade instead of a straight one. 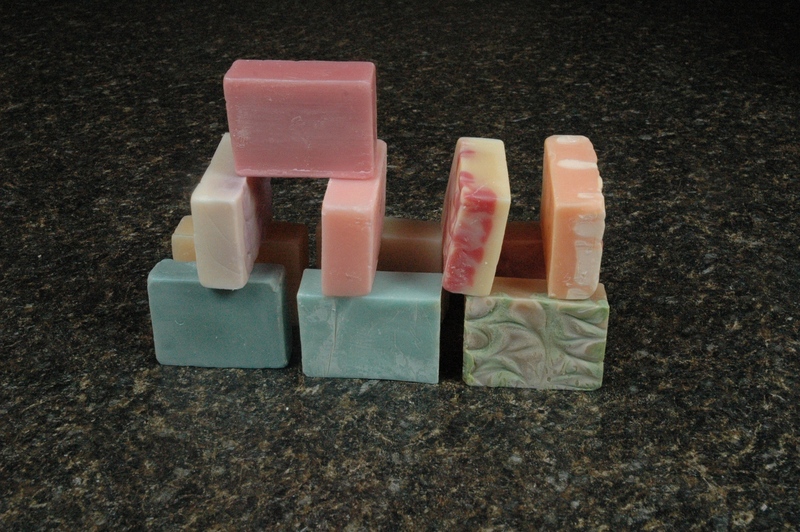 Stacking cold process soaps like Stonehenge allows for lots of air circulation in a small space. The soaps can easily be rotated a quarter turn and then change positions in the stack (what was horizontal is now vertical), this way all surfaces get exposure and the process of drying is shorter in time. I can tell this is going to be another soap epiphany for me. You mean I don’t have to stare at my soap for 6 to 8 weeks before I try it…wow! The “make and wait” process for me to test a recipe is why I only make soap occasionally. The recipes, s.calc., methods and time I have used trying to produce a soap I am truly happy with is fun but at the same time a little frustrating for my OCD. Changing the way I make soap just may give me the up-grade I have been searching for. Feed the OCD! Make a soap this afternoon and use it in the shower Friday morning! I finally fixed all the images, so you can now click on the smaller images and see the full sized image. Sorry about that! I think something in my code work broke. I have trouble getting my soaps out of the molds. I use the rubbermaid container you suggested and a plastic soap mold I ordered from you. The last 4 batches have stuck terribly. I spray each mold with a good amount of Pam which was not successful and I’ve tried putting it in the freezer which didn’t help much. I don’t want to use plastic wrap inside the mold because the details of the mold gets lost and you can’t tell what it is. What could I use that will let me keep the mold details and still get the soap out of the mold without ruining the look of the soap? Thank you for all of the great information! You’ve given me the courage to try making these items, something I wouldn’t have done before finding your site! I’m having a great time learning this skill. Thank you so much! Ack! I see your problem right here. The Pam is simply a saponifiable oil, and that oil can be converted to soap. This conversion makes the Pam act more like soap Super Glue rather than the releasing agent you wanted it to be. For greasing a mold we recommend a thin coating of mineral oil, Vaseline, or a silicone spray that meat grinders use. These are not saponifiable materials. Well, I tried my second batch after reading and re-reading everything. 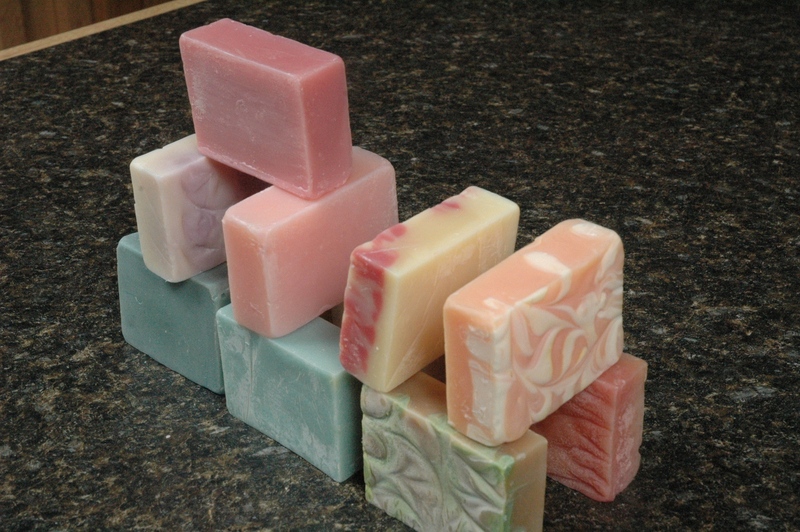 I felt more comfortable and the process went so much faster and smoother than the first batch of soap I did before finding you….thanks!The first batch is fine and the second batch is fine too. however, EVEN though you told me in one of the other posts in the process to use mineral oil, Vaseline, or silicone spray to grease my molds, somehow I converted that to Pam and could not get my soap out of the mold at all (just like jrdgarrett). I ended up having to break the mold bit by bit to get it out (luckily it was just a cheap rubber made one like you have been showing us in) but I learned a lot from that! I wasn’t set in my ways on the temperature reading part, so that is easy to get over and move on to making more soap. It was SO much fun to make the second batch of soap and I am looking forward to another batch in the next week – now the hard part of deciding what to add (scent wise). thank you so much for all you answers to my questions and sharing this process with all of us. Emily!!! Congratulations! It sounds like you are well on your way to having lots of fun making soap. I’m glad you feel more comfortable making the soap. After all, if soap-making is your hobby, then you should have fun doing it, or it isn’t a fun hobby! Have fun choosing your scents! I do well on some recipes to blend in 1-2 % extra water at trace. After moulding and setting 36 hours, some of the water leaves causing the mass to shrink, facilitating removal. If you live in an area that is very dry the soap will be concave. This extra water will cause some problems because the soap now looks cosmetically challenged. If you live in a humid area then this may be the trick you need for getting soap out easily. Hi, what do you mean by using shrink bands onstead of bags? Do you mean to seal the soap in plastic shrink wrap? Wouldn’t that lock moisture in? A shrink band is a tube that closes up the majority of the surface area, leaving opposite ends open. Shrink bands are the easiest way we know of to seal a soap for shipping or selling purposes.